During the summer Microsoft gave developers who attended its TechEd developer’s conference a Samsung 700T tablet preloaded with a pre-release version of Windows 8 to try out. The new operating system is key to Microsoft’s strategy to bridge the gap between the corporate world and the consumer space,that is dominated by the likes of the iPad running iOS and the Samsung Note 10.1 running the Android OS. Windows is likely to remain king of the enterprise desktop laptop and PC market for the foreseeable future, but how well can it run on a tablet? The Samsung 700T is what used to be called a “Slate PC”. It was originally released in 2011, and is effectively a full-blown 11.6 inch touch-screen PC without a keyboard, which is currently selling on Amazon for £766. In terms of spec, it is powered by an Intel Core i5 2467M 1.6GHz, and has 4 GBytes of RAM and a 64 GByte solid state disk. The screen looks amazing. With a bluetooth keyboard and wireless mouse, the Samsung 700T can easily replace a notebook PC – the elegant docking station, that measures 11 x 10 x 1.5cm and doubles as a stand, has an Ethernet connector and HDMI port. 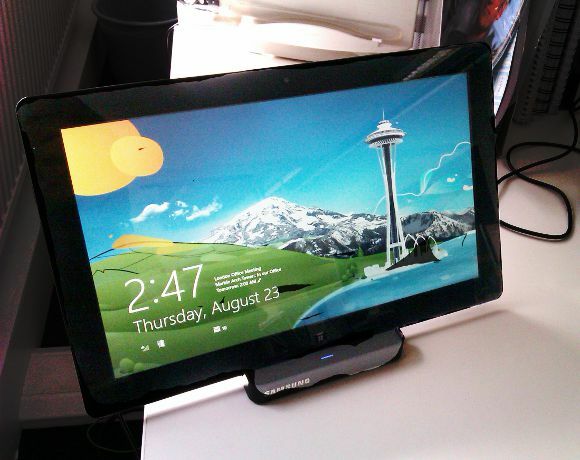 The device is well-suited to running the final shipping version of Windows 8, with its touch-screen user interface. As expected, thanks to Microsoft ActiveSync, connecting the Samsung 700T to an Exchange email server takes a matter of seconds, which should not burden the IT support desk. It requires a Windows Live account and connects seamlessly to Hotmail and Gmail. There are not yet enough applications in the Microsoft Store… no YouTube, Dropbox, no security apps, VPN apps or even BBC iPlayer. Hopefully this changes when Windows 8 ships. Weighing just under a kilo, and limited battery life of around 4-5 hours, it is certainly not a tablet that could be used on the road all day. But, the Kindle app works well, and the large screen makes reading in landscape format particularly comfortable. It will be interesting to see how the Samsung 700T works in a full enterprise environment, as and when VPN software, anti-virus software, ERP, BI and apps like Citrix Receiver are certified for Windows 8.